Even with the accolade of “paradise on earth” Timor Island in Indonesia is just one of the many remote locations of the world that suffer from a lack of primary vision care providers. We met four locals who recently joined our Vision Ambassador program to help provide basic eye care to people living in underserved areas. Yohanna La’a, Maria Seko and the couple Oscar and Florinda told us what drove them to train as a Vision Ambassador. Essilor’s inclusive business arm 2.5 New Vision Generation (2.5 NVG) was launched in 2013 to provide vision care to the 2.5 billion people in the world who don’t have access to the vision correction they need. Most of these people, around 90%, live in developing countries, where conventional distribution channels simply don’t exist. In 2015 the team launched the Vision Ambassador program, a model that trains people to become basic vision care providers with a dual objective: helping to build a local vision care infrastructure and, at the same time, creating a sustainable ecosystem that generates employment and alleviates poverty. Indonesia, a country with 250 million people who live on more than 17,000 islands, suffers from a drastic shortage of eye care professionals and optical stores. Additionally, as in many developing countries – existing eye care services are based in urban centres and therefore not accessible for people living in remote areas. One of the key strengths of the program is its local adaptation to the specific needs, challenges and opportunities of each country. As such, local business developers partner with whichever organisations make the most sense, from public and private hospitals, to non-governmental organizations, skills-building agencies and other inclusive businesses. In Indonesia, the Vision Ambassador program was first piloted in 2015 but it was only last year that partners were found who could help deploy the program. The four Vision Ambassadors we met are all based in Soe, Timor Island. With its 37,000 inhabitants, the city seems more like a village than a city compared to other heavily populated metropolitan areas in Indonesia. 2.5 NVG worked with a small local partner Besi Pa’e to kick-start the program locally. Besi Pa’e is an Indonesian NGO with the mission to alleviate poverty throughout local communities by providing access to the resources, knowledge, information and technology needed to support sustainable activities into the future. These objectives were perfectly in line with 2.5 NVG’s aims and the organization was a great opportunity to reach locals and to introduce them to the program. Yohanna La’a is one of the members of Besi Pa’e and actively engages in social work. 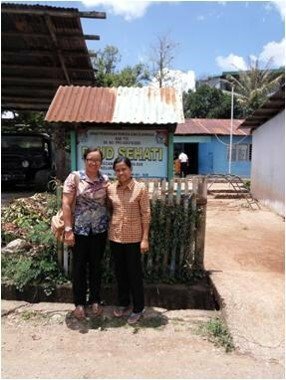 Before joining the Vision Ambassador program, Yohanna was already aware of the importance and impact of good vision and helped to facilitate free cataract surgeries conducted by Besi Pa’e. Yohanna is well known in her neighborhood thanks to her active involvement in the church; now everyone in her community knows that she is the right contact for any near sight vision problems. A retired civil servant, she was fully dependent financially on her pension. 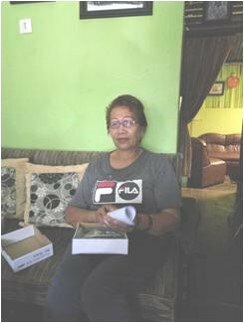 As a Vision Ambassador, she is now not only able to provide information about vision and glasses to her community, but she can also earn a little extra income. Now everyone in her community knows that she is the right contact for any near sight vision problems. Maria Seko also heard about the Vision Ambassador program through Besi Pa’e. She is a teacher at a private pre-Kindergarten school. At work she observes every day how older colleagues and fellow teachers struggle to carry out their profession due to difficulties to see clearly. She explains: “Many of my colleagues and friends here had the same problem starting from a certain age, they just couldn’t see things up close. A pair of glasses can easily help them to regain their ability to see clearly and to be fully productive.” Being able to help these people with such a simple solution as a pair of ready-made glasses was a major incentive for Maria to join the Vision Ambassador program. And she personally wears the glasses that she sells, which is why many of her customers have confidence in her. Many of my colleagues and friends here had the same problem starting from a certain age, they just couldn’t see things up close. It is good to have a job that helps people and makes them happy. Just a few examples that show how the motivation for people to join the Vision Ambassador program is as different as their backgrounds. But at the end of the day they are each contributing to the shared mission of improving lives by making affordable vision care accessible to everyone, everywhere.